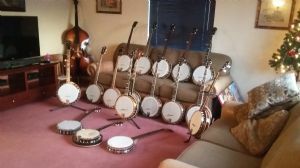 Lets all upload a photo of our banjo collections! I can't get far enough away from my collection to get them all in frame. I share this problem. 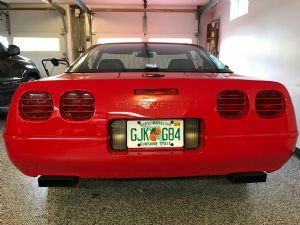 Nice photo, Jim! Oh boy! Nice pictures everybody! 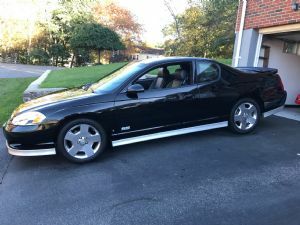 I have detailed pictures and descriptions of a few of mine on my home page. I will try to put some more up there. some of these have been sold....but I've replaced them !! The permanent collection is comprised of the lightweight beater that I travel with and the 12" C. Waldman Chromatic. 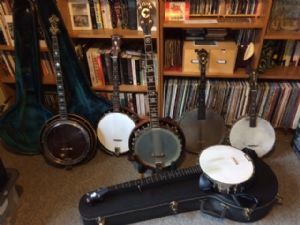 I find the Waldman so surprisingly loud and assertive that it should suffice for bluegrass circles as well. ...but I dream of having a Nechville resonator when I grow up! 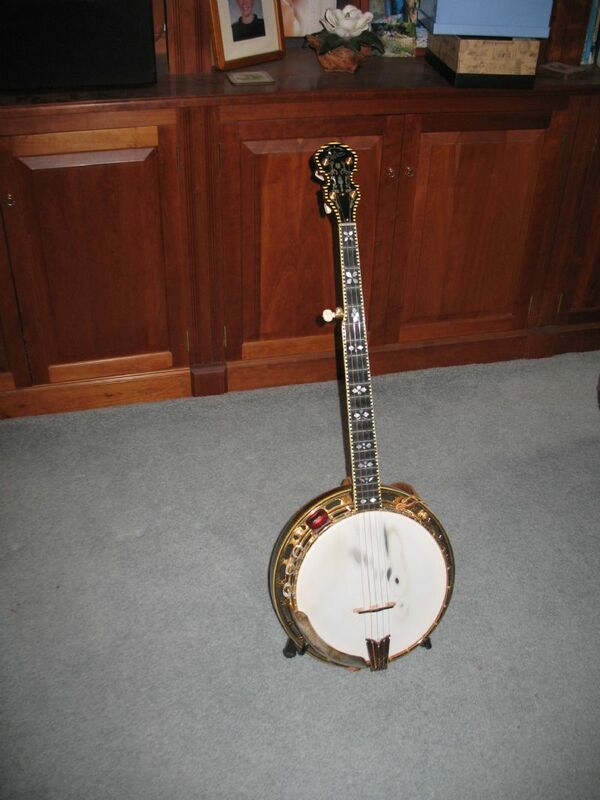 And a vintage tenor resonator. And a Deering banjo uke. Ha! The Cortley has been passed around like a hot potato and I'm going to give it the TLC it so desperately needs to be playable. This was my most recent picture, but it's pretty much a revolving door. I think I added two Vegaphone Pro's since then and have a few less impressive ones not pictured. 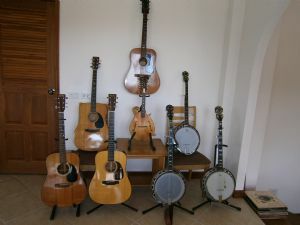 My little collection of banjo's and guitars, Just as well I don't live in the US I would have a room full of banjos. Truth is quality banjos are not available here so I grab what I can when I see it. p.s. 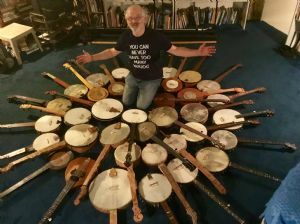 Jim, I love that photo - it looks like you are in danger of falling into a banjo vortex! 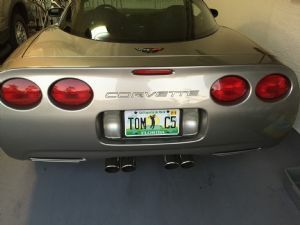 Curious what drives your choices. 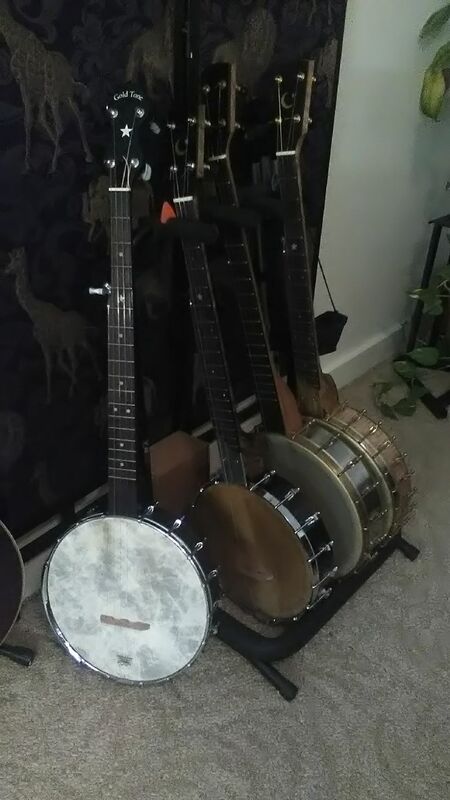 I have one banjo, but I could see having different banjos for different tonal qualities. I have a small collection of vintage cameras, but they’re all different in some respect. 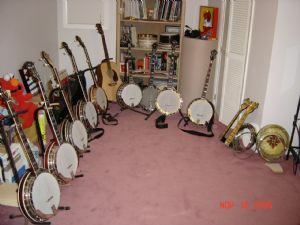 I don’t quite get having a bunch of banjos that are all basically the same. Everybody here will answer that one differently, I imagine. Personally, I started out collecting 1890s, then moved backwards. I’d love to find some from the 1850s or ‘40s, but, being scarcer, they are obviously much pricier. 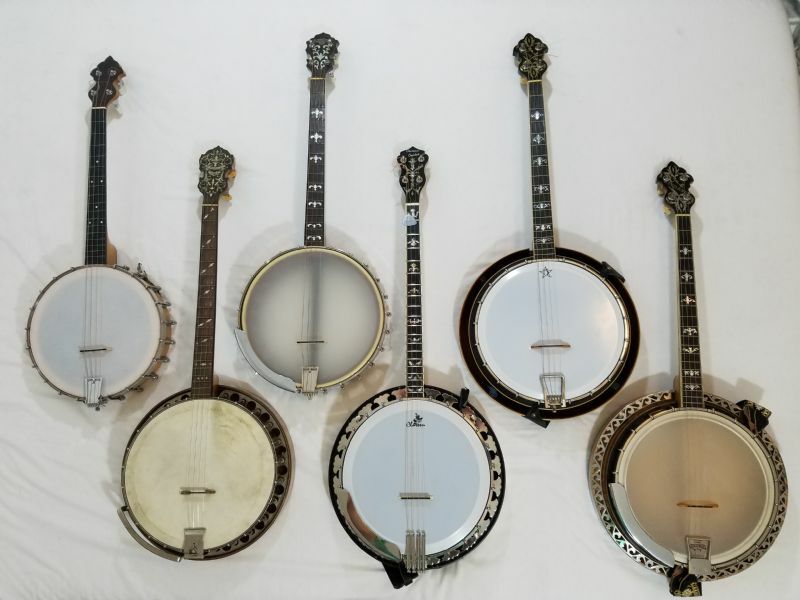 When you're talking about vintage instruments, there are a lot of differences between banjos, even the same model. 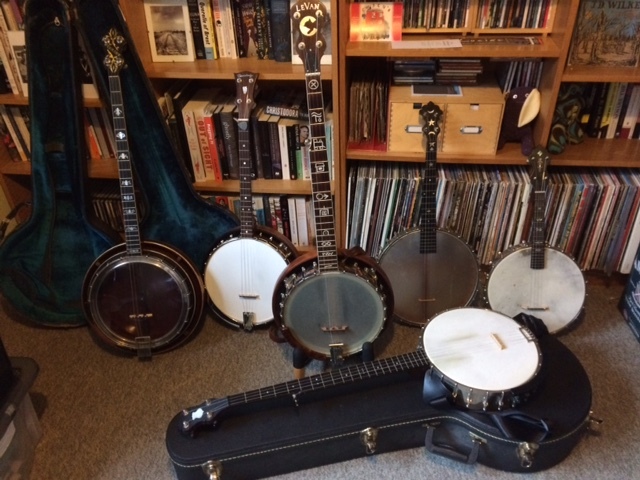 I have a number of Fairbanks Electrics and the sound of each one is unique. 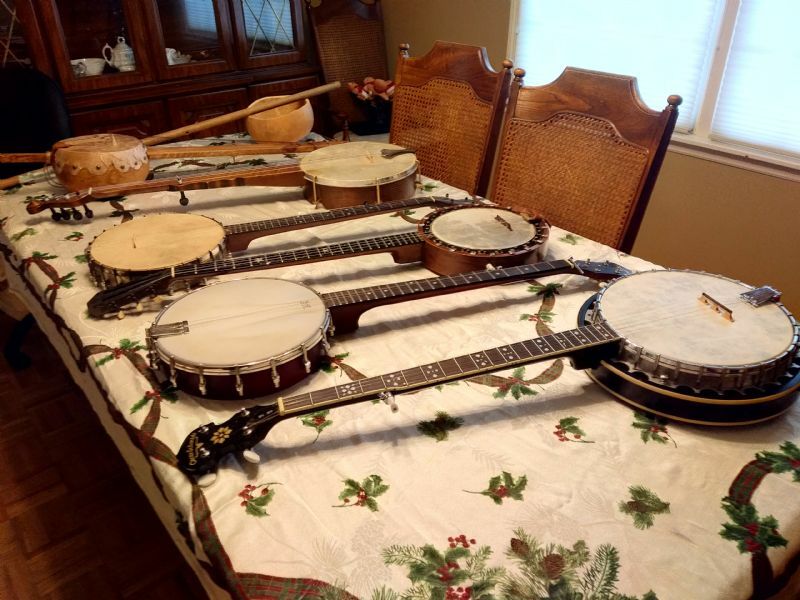 Fairbanks banjos came in a variety of head diameters, scale, tone ring height, etc. 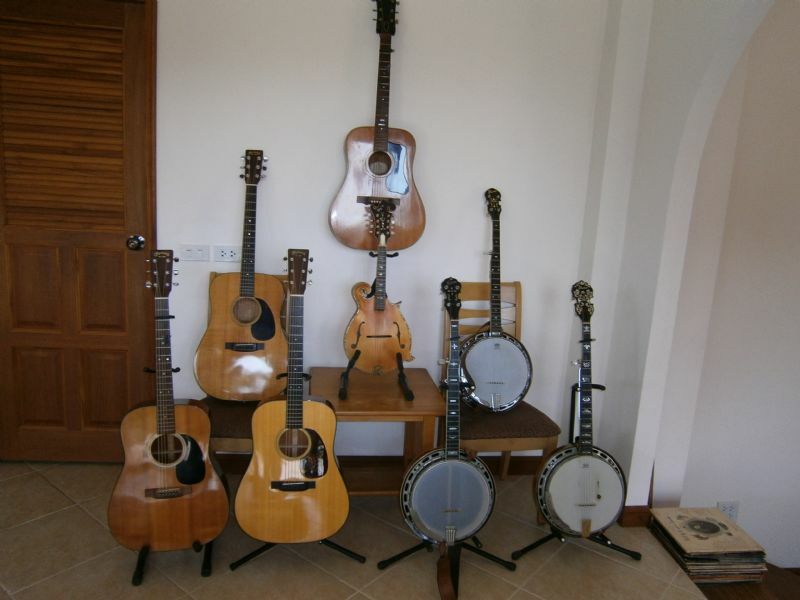 All of these influence the tone. Plus, setup is extremely important for the sound of any banjo. 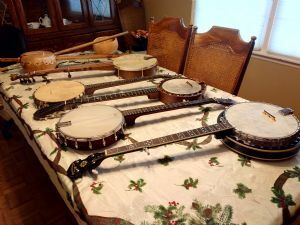 You could take two identical new banjos and set them up to sound vastly different. Calfskin heads, plastic heads, Fiberskyn heads; steel strings, Nylgut strings, gut strings; light gauge vs medium gauge; bridge height; head tension. 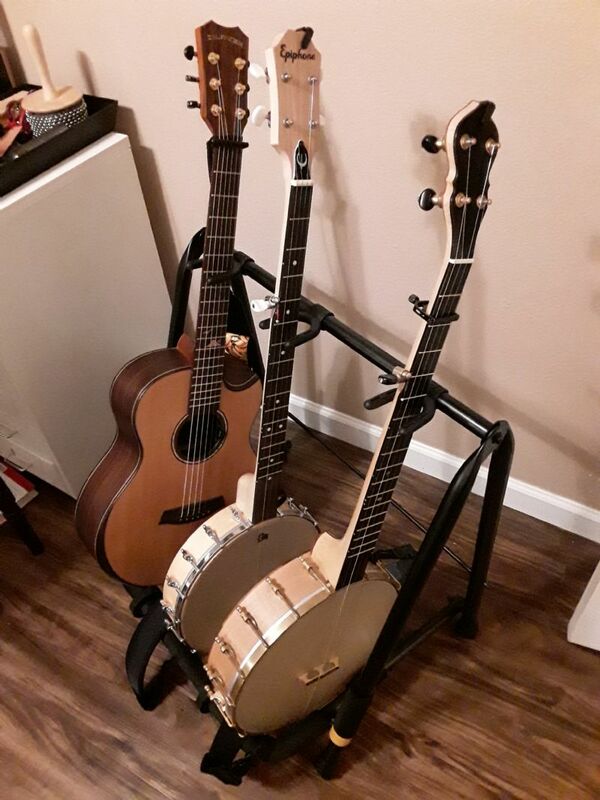 Unlike other acoustic instruments, the fun thing about banjos is that you can easily change any of these whenever you like. 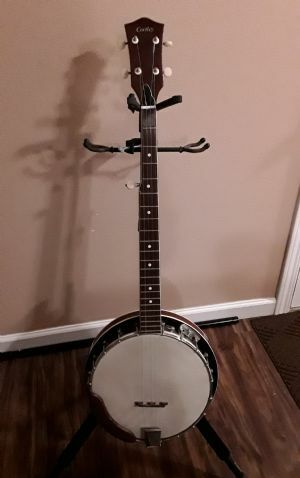 You can have a "new banjo" every day. 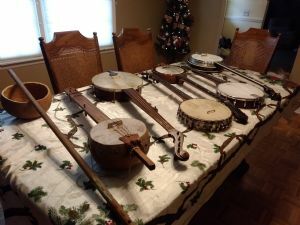 My answer is simple....There are no shops around me with banjos for Irish trad playing, so I had to buy them, fix them, and set them up to determine what I like. 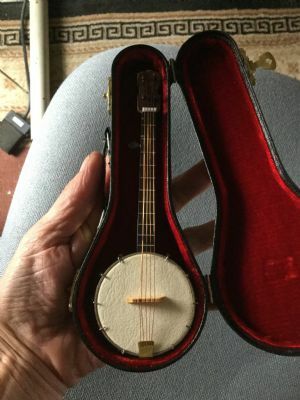 So, when a good one comes up for sale for the right price I buy it, if it doesn't appeal to me more than the 1 or 2 that I play, I sell it. 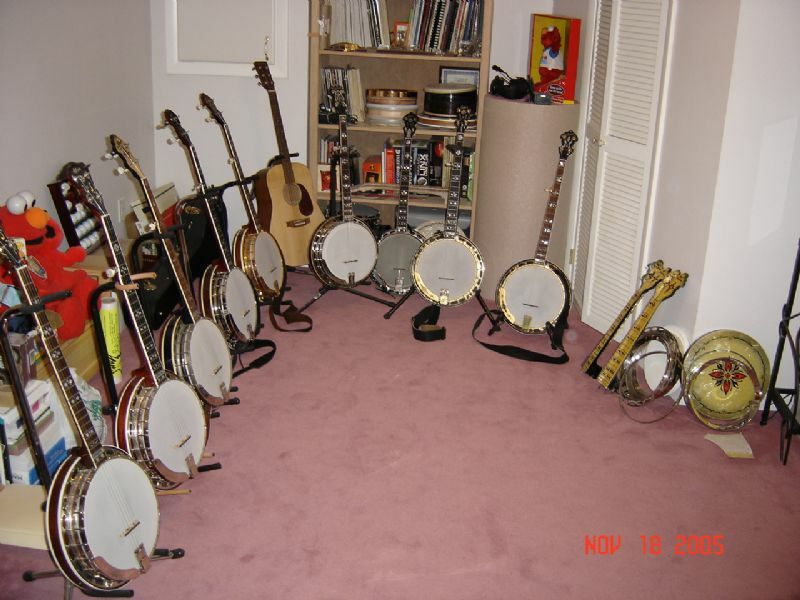 I only need 3 banjos, my main player, a backup, and a camp banjo. You are a lucky man. Not for the banjos, necessarily, but for living with someone who will not only help you into and out of your pile of banjos, but photograph you in the process. Cheers to the spouses/partners who make all of this collecting possible! This is all of mine right now. 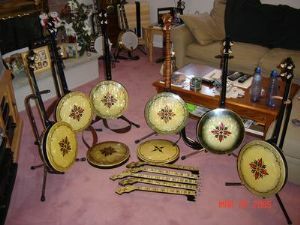 1 unfinished Akonting, 1 early style gourd banjo, 2 modern banjos, 1 minstrel banjo made by Terry Bell, and 2 Early 20th century antique banjos. 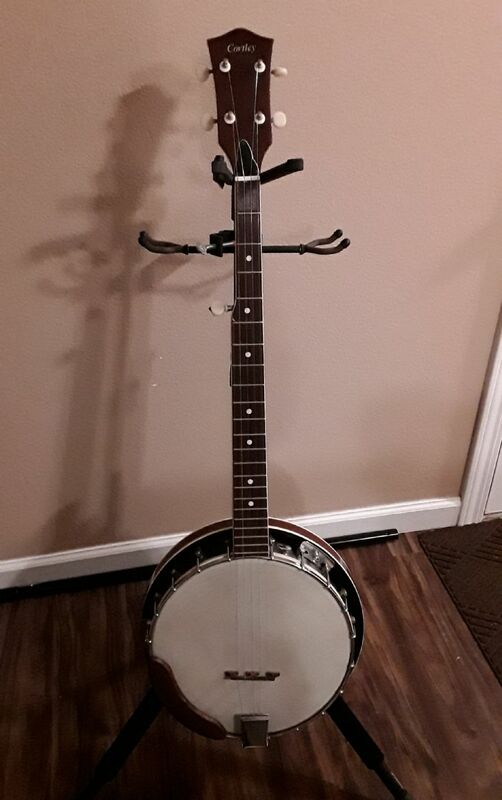 I am getting another antique banjo soon, I suspect was made somewhere between 1868 and 1879. A very good point! Poor Lydia had to crawl up a tall, rickety ladder to take this shot. Couldn't have done it without her! 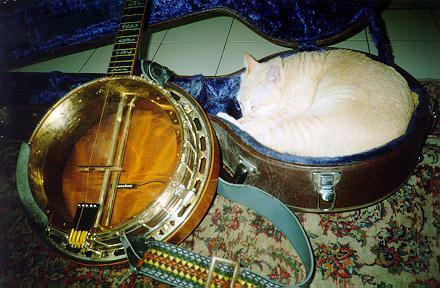 Just a warning folks, never put your banjo in the dryer. This was on the gentle cycle too! I think an interesting follow up thread to this one would be, "Your significant other as they look upon and contemplate your banjo collection..."